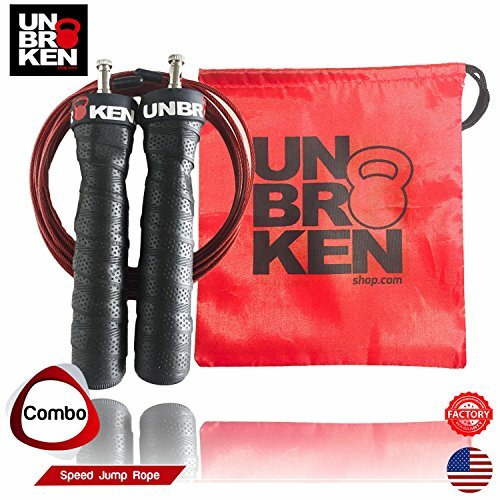 UNBROKEN Cross Fitness SPEED JUMP ROPE This is a high quality jump rope to Get your double under with Unbroken speed Jump Ropes, super fast. Finally for athletes who are struggling with double under and singles this new jump rope will help you to make it happen. HANDLE Ergonomically designed handles allow you to keep a relaxed grip in your hands during your jumps. Handle wrapped with absorbent grip to keep the handle in place even with wet hands.Handles are 6 inches long and 1 inch in diameter ROPE Adjust to customize your rope length like you want it, this is a PVC Coated wire Rope.10FT adjustable rope length, about 3m; 2.5mm thickness ropes. BEARINGS Made it to performance in High Speed, It come with a High Quality bearing. If you have any questions about this product by Unbrokenshop.com, contact us by completing and submitting the form below. If you are looking for a specif part number, please include it with your message. New Speed Jump Rope - Premium Quality - Adjustable - Free Carrying Bag, Spare Cable & Workout Ebook - Sleek and Strong - Excellent for Cardio & Fitness Trainings, Crossfit Workouts and Boxing!